With fall temperatures shifting, it’s the full-bodied reds that seem to make their way to our evenings and dinner tables with greater frequency. Tonight it was the 337 Cabernet Sauvignon from Nobel Vines, the Menteca, California winemaker. My wife picked this one and sipped from a stemmed glass; I from a Riedel Bordeaux stemless glass. No real intention there as much as what was handy as we uncorked the bottle. 2011 337 Cabernet Sauvignon, Lodi, California, USA. We picked the 337 primarily because our meal consisted of wax beans, peas, garlic mashed potatoes, and killer steaks. The latter, selected fresh from the deli, held in a ton of flavor and juice. Great seasoning too, much like our Cabernet selection. The 2011 vintage contains a slew of red fruit scents; some spice as well, and those combinations always seem to work well for me. I can see this complementing pasta just as effectively as it did our steaks. 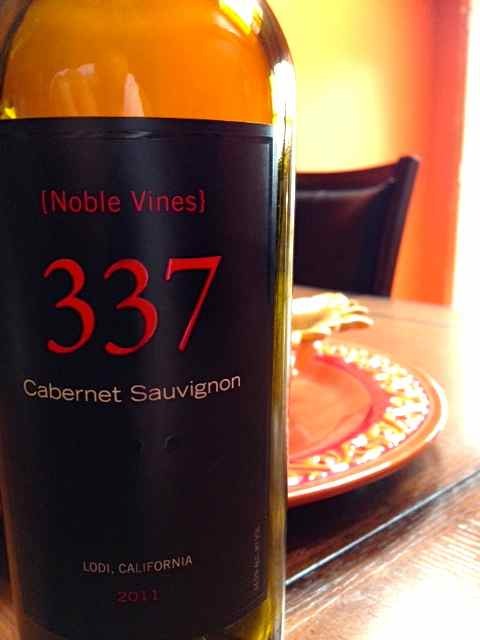 The winemaker claims, “Noble Vines 337 is the most coveted Cabernet Sauvignon vine stock in Bordeaux, France. These rare vines are prized for their concentrated flavor and thrive in the red soils and cobblestones of our Lodi vineyard.” Okay, some self-aggrandizing in that label, but the results do stand up favorably to the Bordeauxs and Cabs we have sampled as of late. This entry was posted in Cabernet Sauvignon and tagged California, california winemaking, Lodi, USA.